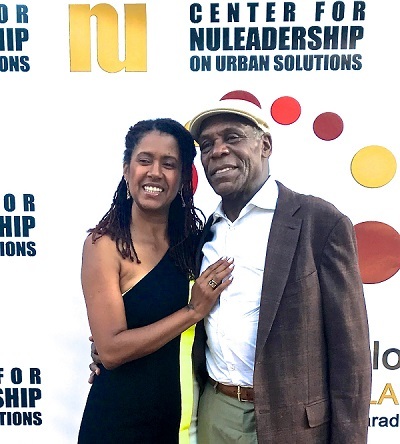 Friends of actor and activist Danny Glover celebrated his 71st birthday at an estate in View Park on Saturday, July 22. The night also brought awareness to the issues of police reform and the problems with mass incarceration. “A lot of the work we’re doing is changing hearts,” impactful words spoken by Kimberley Guillemet, Esq., the manager of the Los Angeles Mayor’s Office of Reentry, opening the 2017 Human Justice Awards. Actor Malik Yoba and actress Sabra Williams emceed the ceremony. Actors Carl Lumbly (Men of Honor, “NCIS Los Angeles”) and Mike Ferrell (“M*A*S*H”), two members of Glover’s Human Justice Celebrity Ambassador Circle, were also in attendance. Glover’s biggest ‘gift’ this year was not what he received but what he was able to give, lending his influence to a cause near to his heart. ‘Human Justice,’ a term conceptualized by the Center for NuLeadership on Urban Solutions (CNUS) based in New York City. 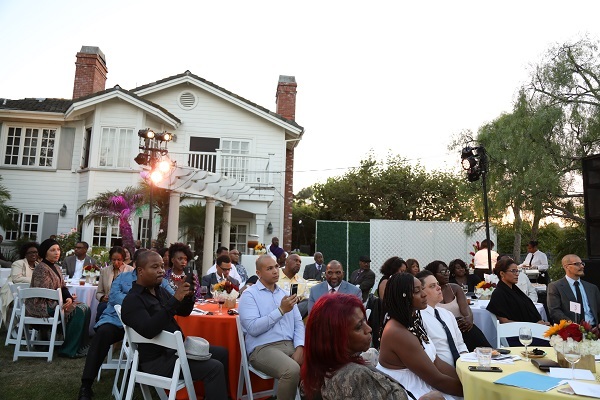 “We could not find a more appropriate place than Los Angeles to launch the Human Justice Revolution,” said Dr. Divine Pryor, executive director and Founder of the CNUS. The ‘Human Justice’ formula referred to by Pryor is human rights plus human development, which equals human justice. The organization’s website describes its mission as: transforming the practice of public safety, justice and accountability from criminal to human. The United States has the world’s largest prison population and the CNUS fights against prison expansion claiming it is not the solution. In the U.S., more than 2.3 million individuals are currently incarcerated and approximately seven million children living away from their incarcerated parents. Dr. Pryor also shared statistics on the nation’s recidivism rate, which represents the tendency of a convicted criminal to reoffend. Seven out of 10 individuals go back within three years and one-third of those individuals return in the first year. “We have tolerated this recidivism in our nation for the last 50 years; it’s time for it to come to a stop,” said Dr. Pryor. Other members of the CNUS shared their stories of incarceration, reentry and what ‘Human Justice’ means to them. Cory Greene was formerly incarcerated but now he is a Ph.D. candidate and healing justice coordinator at the center. “What are the muscles that we need to build within ourselves to help us connect to other people that seem so far away from us, that seem so different from us, that seem so invisible? That’s what human justice is about,” said Greene. The night continued with food, live music and a moving performance from the Lula Washington School of Dance. The crowd paused for a video tribute celebrating Danny Glover. Glover received the Human Justice Award, thanking the Center for NuLeadership on Urban Solutions for their commitment to issues often overlooked or ignored, such as reentry and mass incarceration. Glover first met with members of the center five years ago and was amazed. “We have to elect officials who are accountable to their community, not the interests of wealth … they have to be in the interest of social justice, human justice and us, we the people,” Glover said. Glover also mentioned the ongoing refugee crisis, which he says is the largest since WWII, and how climate change could soon worsen that problem. Returning to the issue of human justice, the iconic actor says citizens must consider the institutions we want to build, the leadership we choose and the kind of world we want for future generations.